This month sees two significant and related anniversaries. Twelve years ago this week Israel began its unilateral pull out from the Gaza Strip, while 26 August marks the third anniversary of the end of Operation Protective Edge, the 50-day bloody conflict waged by the Jewish state to stop Hamas’ rocket attacks. The Gaza withdrawal and its aftermath – Hamas’ violent coup against Fatah in 2007 which ushered in a decade of war and instability – is seared into Israeli public consciousness. While a majority of Israelis continue to support a two-state solution, many doubt whether it is currently practicable and fear that the West Bank, like Gaza, may turn into a failed state under the sway of violent Islamist terrorists. Hamas rocket attacks began before Israel’s withdrawal from Gaza, but they reached a new intensity following it. From 2001-14, more than 15,200 rockets and mortars – an average of three each day – were launched from Gaza into Israel, many landing in civilian areas. However, 11,600 of these attacks followed the 2005 pull out. On three occasions over the past decade – in 2008, 2012 and 2014 – Hamas has lured Israel into conflict by stepping-up its attacks. The 2014 war was preceded by a seven-month barrage of rocket attacks – 500 in all – while more than 200 Qassam rockets and mortar shells landed in the western Negev region in the two months prior to the launch of Operation Cast Lead in December 2008. Since Operation Protective Edge, Hamas has been restocking its arsenal and rebuilding the terror tunnels which it has constructed under the Gaza-Israel border, readying itself for launching a new conflict. Indeed, after each war with Israel rearmament, not reconstruction, has been Hamas’ overriding priority. The terrorist group makes no secret nor apologies for this. As Khaled Mashal, then head of Hamas’ Political Bureau, announced at a conference in Damascus in the wake of Operation Cast Lead: “On the surface [statements in the Gaza Strip] refer to reconciliation [between Hamas and Fatah] and rebuilding, however, what is not revealed is that most of Hamas’ funds and efforts are invested in the resistance and military preparations.” Similarly, less than a month after August 2014’s ceasefire, Hamas co-founder and former foreign minister Mahmoud al-Zahar pledged the group would “build new tunnels” to replace those destroyed the IDF. These are not idle boasts. During the 2014 conflict, the IDF uncovered 32 Hamas tunnels, destroying most of them. Within four months of the end of hostilities, the IDF confirmed Hamas’ claims to be rebuilding its tunnels. Two years on, Israeli security sources suggested that at least 15 Hamas tunnels now extended into Israel. The tunnels are major works of construction; some contain rooms for resting, showers and dining areas. By January 2017, Hamas was also believed to have refilled its depleted weapons cache. In a show of force, Hamas carried out a number of rocket test launches into the Mediterranean sea in May 2017. Hamas’ fire-power is now believed to be potentially more deadly than it was three years ago. In March 2017, it was reported that it had acquired highly explosive short-range rockets, which are more powerful than those it previously deployed. Each rocket is said to contain hundreds of kilogrammes of explosive materials and would have a devastating impact on Israel’s southern communities. During the 2014 war, five Hamas naval commandos attempted to infiltrate an Israeli kibbutz to carry out a terrorist attack. While this operation was thwarted, Hamas has used the last three years to significantly expand its naval unit. Today, there are an estimated 1,500 frogmen under its command, with Hamas said to have developed tactics and weaponry for sea-based warfare. The commander of Israel’s Ashdod Observation Company suggests that Hamas naval commandos train “endlessly” to carry out attacks on them. Hamas is preparing another generation for war with Israel. Its annual summer camps are attended by tens of thousands of Gazan children and young people. They are subject to both ideological indoctrination and military training, which is carried out with real weapons, mostly light arms and RPG launchers. This summer’s camps featured simulations of infiltration of Israel through tunnels, attacks on IDF posts and capturing and abducting IDF soldiers. 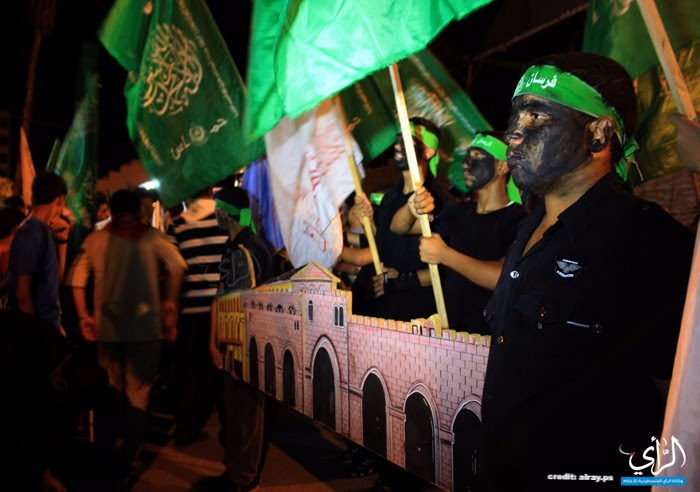 This week Hamas also celebrated one of the most notorious of the many suicide attacks it has carried out since it imported the terror tactic to Israel barely six months after the signing of the Oslo Accords. The attack on Jerusalem’s Sbarro pizzeria – which killed 15 people, including seven children – occurred on 9 August 2001. Hamas’ Al-Aqsa Channel marked the 16th anniversary of this brutal attack – one of more than 140 suicide bombings which claimed the lives of 542 civilians between 2000 and 2007 – by declaring: “The news of the operation made Palestinians joyous everywhere. The largest celebrations in honour of the hero [suicide bomber Al-Masri] … Masses of people went out to the streets, cheered, and distributed candies out of happiness.” Last year, Hamas called upon activists to resume suicide bombings, in particular urging attacks on buses. In April 2016, a member of Hamas blew himself up on a Jerusalem bus injuring 20 people. Suicide bombings have, however, largely been thwarted by Israel’s construction of a security fence which has made infiltration of bombers into the country from the West Bank far more difficult. Israel has accused Hamas of rebuilding tunnels in areas designed to maximise civilian casualties in the event of another conflict. This month, the head of the IDF Southern Command revealed the location of two alleged Hamas tunnels beneath an apartment block and a family home. According to the IDF one of the tunnels connects to a mosque and is close to a school. In June the UN Palestinian refugees agency, UNRWA, announced that it had discovered another tunnel belonging to Hamas under one of its schools, itself part of a compound which comprises other schools in Gaza’s Maghazi refugee camp. Hearing tunnel digging by Hamas forces near their homes, Palestinians living near the border with Israel have expressed fear of the implications: “I am sure, one million percent, that those with tunnels under their houses cannot sleep, or taste the joy of life,” said one woman. For Hamas, their lives are utterly expendable. Its mission – “to liberate every inch of Palestine, and restore its Islamic, Arab, and humanistic identity,” as a May 2017 policy document put it – has no place for compromise, reconciliation or for the respect of human life, Israeli or Palestinian. ← Analysis: The end of the road for Bibi?